Almost two weeks ago, on the evening of April 14th, my husband and I were just starting to get ready for bed when a flash of light outside lit up our entire home. A little bit later we heard a huge boom. Puzzled, my husband went outside to investigate, thinking it might have been a thunderstorm coming but the sky was perfectly clear. Later on we learned that the bright light and boom was a meteor. According to news reports, the meteor shot across the sky a little after 10:00 p.m. and was witnessed in at least six states including Iowa, Wisconsin, Illinois, Minnesota, Missouri and Michigan. Now, farmers in the rural Southwestern part of Wisconsin are finding meteorite fragments in their fields and meteorite hunters are canvasing the area, hoping to find one of those special chunks from the sky. One of my high school friend's parents found a meteorite on their farmland. Upon hearing the news of the exciting nighttime event, my daughter looked extremely disappointed. She wished she had been awake to see the light and hear the boom. Even though she didn't witness the fireball, she still is quite interested in learning more about them. We've watched a few of the news updates that have featured people talking about the meteorites and read a few of the news articles online. This week we also checked out a couple of books from the library about meteors and meteorites. 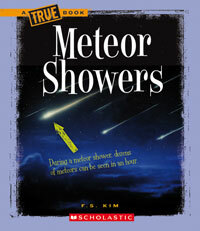 Meteor Showers, part of the A True Book Series, is an up-to-date and educational book on all things meteor related. The text discusses meteor showers, how meteors are created and shows how the Earth's gravity pulls the meteor into the atmosphere. One section focuses on the material make up of meteorites and another covers meteoritics, the study of meteorites. Major keywords like meteor, meteoroids and asteroids are in bold with the pronunciation in parenthesis. The well laid out design includes color pictures on nearly all the pages and the stylish layout makes the book fun to browse through like a magazine or read from cover to cover. My daughter loved the picture of the largest meteorite found in the US (Willamette Meteorite) and also the picture of the Meteor Crater in Arizona. Here's one other fun fact we learned: "About 26,000 meteorites that are larger than a pebble land on Earth each year." That leaves us to wonder how many meteorites they'll discover in Wisconsin from the meteor that flew by a couple weeks ago! We also read Meteor! by Patrica Polacco. The humorous story tells what happens when a meteor falls on the farmland of a grampa and gramma that live in Mudsock Meadow, a place near the town of Union City, Michigan. In the story, the meteor seems to have magical powers. The illustrations wonderfully portray the excitement of the curious townspeople as they check out and talk about the special meteor. Meteor! is based on an actual meteorite crash on Polacco's grandfather's farm. According to Polacco's website, the family uses the meteorite as their headstone. The story is a bit lengthy, best read to kids ages 5 and up. Wisconsin State Journal - "Meteorite mania: 'They're going to tell their grandchildren about this"
Milwaukee Journal Sentinel - "Meteorite hunters descend on Iowa County farms"
That's so awesome that you made sure you got some books about meteorites for her! These sound great for when my daughter is a bit bigger and understands more. Thanks for stopping by my blog and letting me know about the other children's meme's!